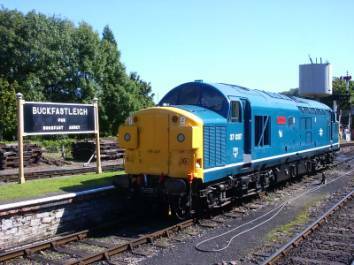 The loco started off the season of evening trains on Monday 18th July. 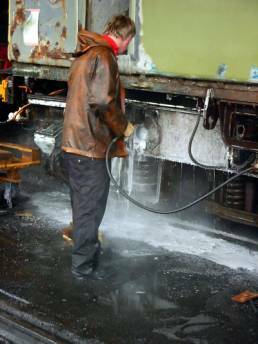 The loco has suffered a fuel leak on one of the high-pressure steel pipes on a cylinder head; this was repaired after a few days. The loco had a clean up before working a driver experience turn on Sunday 25th September. The tool that compresses the piston rings when the pistons are lowered back in to the cylinder liners arrived on site in July thanks to the 71A group for loading this piece of equipment. It is hope that we can hold on to this until the 33, has had the same treatment. A small set back occurred when a replacement piston (Ex class 47) for No.5 liner was having its gudgeon pin removed. It was bigger than the one from the original piston (we now have two class 47 pistons for sale!). So the spare power unit (ex 26032) has giving up one of its pistons to get things moving again. The valves have had their faces re-ground by a firm in Plymouth. Which means a start on grinding the valve seats in the cylinder heads has now begun and by the end of September three heads had been done, ready for the springs to be re-assembled then painting. The tidying up of the body has made progress with the body sides now in primer. The roof grills have been removed on both sides. These can now be cleaned and repaired as required along with the slats, which the grills cover. At the end of July the No. 1 cab had an all-new metal front. The floor panels in this cab have all been taken up and it looks good underneath with only cleaning then a coating of wax oil needed. All below the sole bar has been de-greased with the steam cleaner. The alloy strips along the top of the body side have been removed, as they were somewhat bent plus they were hiding a bit of a mess. These are now being replaced with new strips, but some bit had to wait until some new steel was welded around the certain areas were the alloy strips are fitted. By the end of September both sides were finished with the station being the last side. A class 33, an engineless shell has come our way for spares. We have paid the road transport cost to get the loco to Kingsbury, Birmingham, but a last minute hitch came to light as the transport was on it’s way to Scotland. It would seem a bill by the owner has not been paid, so we will have to wait to see what the out come is? We needed to raise £3000 for this to happen and in a matter of days after the call went out we had half of the above amount. Many thanks to all those that replied promptly. 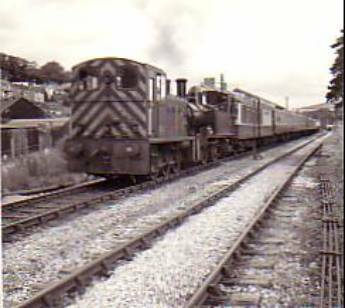 Still working around the station at Buckfastleigh. Not been started for a while. It is thought a battery fault may have occurred. 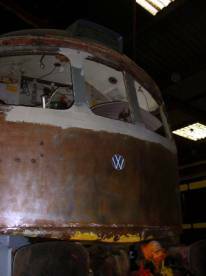 The overhaul of this loco gets nearer as each year passes, re the driver experiences days. This year the day courses have been well attended with only two classes of loco to choose from. 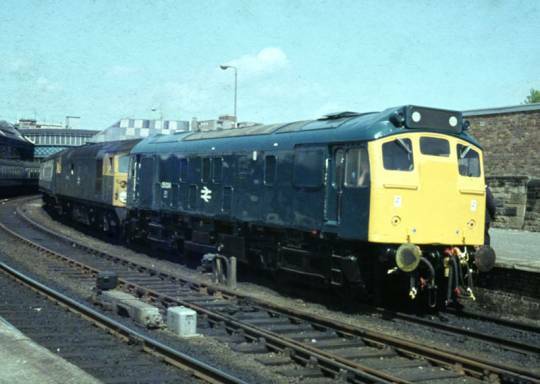 Next year should see the class 25 back to give more of a choice. So if anyone knows of anyone that may be interested please pass on this phone number 0845 345 1420 or e-mail experience@southdevonrailway.org. If each day next year is full then the more money will go towards the overhaul. Has done a couple of weeks on the evening trains to help crews to refresh/learn the loco. It has also been named “Loch Treig”. Waiting at Buckfastleigh for some body repairs to start. 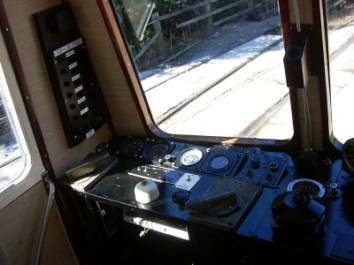 By the end of August the brake van end cab was ready for the gauges & switch panels to be re-connected up. This was done by mid September, making the cab look more like it should be. The large saloon is still having the wooden trim fitted. A slow and fiddly job! Ran for the owning group towards the start of July, but ended up on two engines. After a six or seven week spell stabled at Staverton it was returned to Buckfastleigh on Wednesday 14th Sept (on one engine) ready for a spin at the transport weekend. Been dragged by 20118 for the driver experience on 25th Sept. In service up till a spring broke on the middle axle. No change from last time. Under cover in the P.L.O.G. shed. The loco now stabled out side by the P.L.O.G. shed has had some work done on the carburettor of the donkey engine, but for some reason the engine will not start. This engine is started to make air pressure to start the main engine as there are no batteries or starter motor on the loco. CCT W94556 – No change. CCT M94852 – No change. SHOCK VAN – No change. 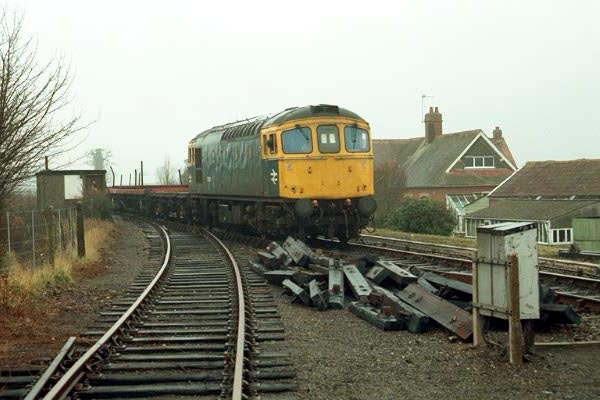 November 5th & 6th – In house diesel gala. Last running Sunday 2nd October. 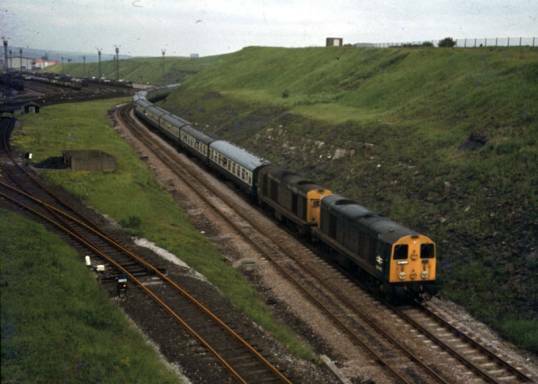 20013 & 170 Passing around Tinsley yard on 17-6-78 with a special railtour. 013 Was broken up at M.C. Metals of Glasgow on 29-9-93 and 170 was broken a few days earlier at M.C. Metals on 12-9-93. 33010 Passing the siding at Newcourt on the Exmouth branch near Topsham on 18-3-86. 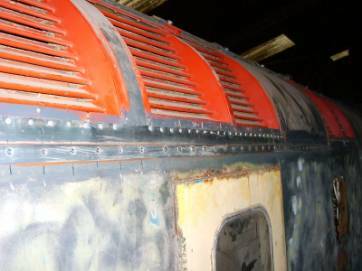 The loco was withdrawn a year later with severe electrical faults and was cut up on site at Eastleigh works after the body was grounded by V. Berry in February 1989. 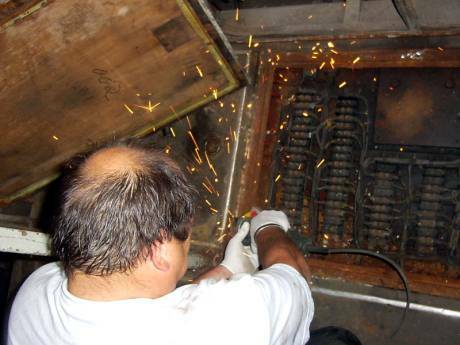 Bogie cleaning under way and white glove man removing the old screws that held the floor down in No.1 cab. Run to the sun next year? The new alloy strips on the riverside of the loco. 55000 Cab the brake van end coming together. 37037 After the naming it wait to work the 15.00 to Totnes. Buckfasleigh in the early years. 03 & 14XX.